In a world overrun with the undead, a handful of heroes band together in the ruins of Los Angeles to protect the survivors and try to rebuild civilisation. St George, (formally The Mighty Dragon), Gorgon, Stealth, Zzzap and Cerebus work hard to keep their sanctum, The Mount, safe not only from zombies but from an army formed out of an old LA street gang. A new villain comes to light who might succeed where the zombies have failed and wipe out the settlement. It impresses me that with so many zombie stories out there, every now and then I still come across something new. Zombies and superheroes have been put together before but this is the first time I read a whole novel about the idea and it is done very well. While you might think the premise silly, it is played absolutely straight, so you don't notice that while reading it. For the most part it is light in tone for a zombie novel, but there are a couple of genuinely creepy moments. The heroes' various superpowers were fairly run of the mill. My favourite was probably Cerebus, who didn't have superpowers at all, but rather a giant armoured mech suit of her own design. The moral I am going to take from this one is that when your friend becomes a zombie, you must kill them, and this goes double if your friend is a superhero. Zombies with superpowers add unnecessary extra danger to an already ridiculously dangerous world. The book is available in paperback, e-book or audio book formats. The audiobook version is well done, with two narrators, Jay Snyder and Khristine Hvam, taking on the male and female parts respectively. Neither fall into the overacting that can sometimes ruin an audio book and there is no distracting music or sound effects. 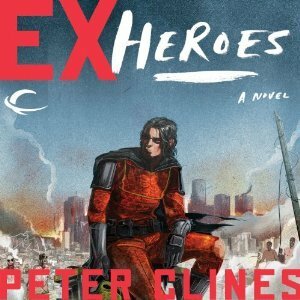 Ex-Heroes will probably appeal to fans of zombies or superheroes, and others in search of quick, fairly light, read. If you enjoy this one there are more books in the series: Ex Patriots, Ex-Communication and Ex-Purgatory.